I’m starting to see granny squares in my sleep. I wouldn’t be surprised if I go through the motions in a sound sleep. They’re turning out awesome though. I’m very happy with them. I’m using Deramores Stylecraft DK. I highly recommend it. The color selection is incredible. I love the colors I picked out for my squares. The price of a skein is great too. They’re 1.99 in UK money. With currency exchange today that’s only $3.11 here in the US. I spend more than that for yarn at my local AC Moore and Deramores has a much better range of colors. So if you’re in the US don’t be afraid to order from across the pond. I’m not sure yet that I’m not just talking to myself on my brand new blog but then talking to myself isn’t really a new thing. 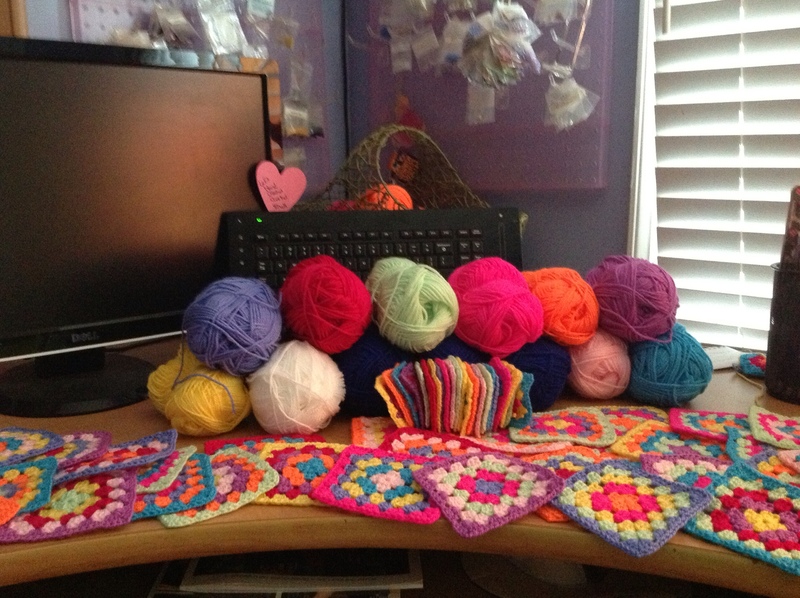 All of my granny squares so far. If my calculations are correct I need 99 of them for a throw. I’ve got about 35 by now and then I’ve also got about 20 of the little ones made. They’re all ready to get a couple more rounds on them. I love the yarn colors! I love all the colors! I can’t wait to see the finished product! Great colors! I’m going to check out the yarn you suggested!